Patel, S. (2011). Harmful and beneficial aspects of Parthenium hysterophorus: an update. 3 Biotech. 1, 1–9. One record from an agricultural field at UC Riverside in 1981. A second colony was recently detected and confirmed by CDFA in Santa Ana, Orange County, CA. A third very small infestation of two plants has also been detected in Irvine, Orange County, CA. Naturalized in the KwaZulu-Natal region of South Africa, which matches California. Aggressively colonizes disturbed sites. Affects the production of crops. Invasive in northern KwaZulu-Natal, South Africa, where it is called famine weed due to its (potential?) impacts on crops. Noxious weed in Puerto Rico. Invasive in India, environmental weed in Australia (Randall 2012). CABI says it's a declared noxious weed in Queensland, AU, but the Queensland website says only that it invades pastures, floodplains, grasslands, open woodlands, waste areas, disturbed sites, lawns, gardens and crops (no legal listing). Invasive in northern KwaZulu-Natal, South Africa, where it is called famine weed due to its (potential?) impacts on crops. 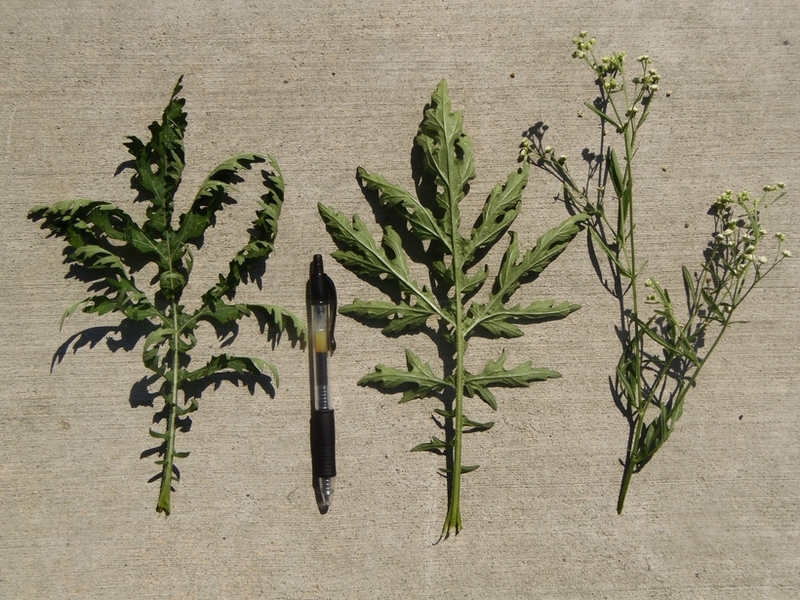 Randall 2012 lists several other Parthenium spp as weeds (agricultural) but I could not find details. Prefers climates classified as Cf, Cs, Cw in the Trewartha-Koppen climate system. Cs = Warm average temp. > 10°C, Cold average temp. > 0°C, dry summers (according to CABI data). These are climate zones that match California. However, most locations on GBIF map (http://www.gbif.org/species/3086784) are in portions of Central America, South America, Asia and Australia that do not match California based on Cal-IPC's climate map. Allelopathic properties allow it to suppress native vegetation in a wide range of habitats. Can find no mention of this, despite the thorough description in the CABI datasheet. This weed is considered to be a cause of allergic respiratory problems, contact dermatitis, mutagenicity in human and livestock. Crop production is drastically reduced owing to its allelopathy. Based on herbarium specimens in Tropicos, and that it's an annual herb, it does not seem large enough to create 'impenetrable" thickets. Missouri Botanical Garden (2015). Tropicos. It is unable to reproduce vegetatively from plant parts or by apomixis. A prolific seed producer. Produces 10,000 to 15,000 viable seeds per plant. Produces 10,000 to 15,000 viable seeds per plant. In Australia, parthenium weed germinates mainly in spring and early summer. It produces flowers and seeds throughout its life and dies in late autumn. Flowering may begin as early as 4 weeks after seedling emergence and plants continue to flower for extended periods (6-8 months) when conditions permit. Yes. Annual or short-lived perennial so it must produce seeds within the first three years. Has small and light seeds that are capable of long distance travel via wind, water, birds, vehicles, farm machinery and other animal traffic. Has small and light seeds that are capable of long distance travel via wind, water, birds, vehicles, farm machinery and other animal traffic. Also transported in garden waste.